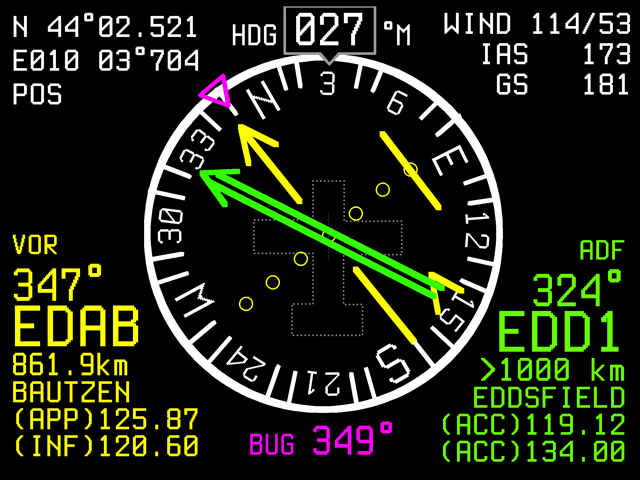 The HSI screen display: Current position, Heading Distance, Direction, Radials relative to reference navigation points, Approximate wind data. The AvMap Ultra also provides navigation back-up: in the HSI screen you can select from the preloaded Jeppesen Database an Airport, a VOR station or NDB transmitter as your navigation point. The Ultra EFIS contains an internal world magnetic model that allows it to calculate the local magnetic deviation and dip. The Ultra EFIS can calculate current position and ground speed even in the absence of GPS.